A good cocktail is one of my favorite things. I’m always up to try something new, and love expanding my repertoire. During the summer, I want something that’s not such a heavy cocktail. too. 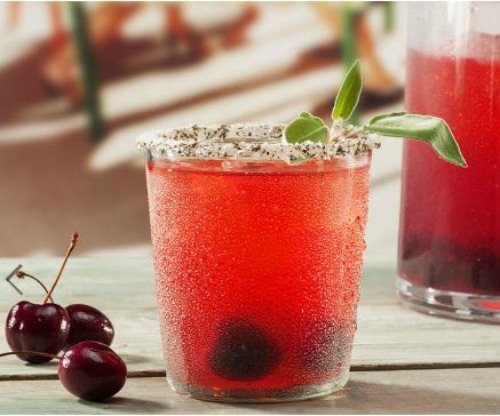 This Cherry Sage Smash cocktail is a perfect addition to all of your summer entertaining – and beyond! Cherry Sage Smash is tequila based. Now, I know what you’re thinking “Noooo…I can’t do tequila…” A good tequila isn’t like the tequila we used to drink. It’s a pleasant experience. Add in the fresh flavors of cherry, lime, and sage, and you have a winning combination. This is one of those cocktails that you can make a batch of, too, and is perfect for entertaining. A refreshing tequila based cocktail with fresh cherry, lime, and sage flavors. Combine all ingredients into a shaker and muddle. Add ice, shake, and strain into a salt-rimmed glass. See?? It’s so easy to make a Cherry Sage Smash cocktail. Will you be adding this to your cocktail recipe repertoire?